Jimi’s on the play for our opening Lorywn tilt, and she opens with a Mountain. Over to me, it’s a Forest into an early Elvish Eulogist, a card that’s all but useless at present but might net some early damage. Next turn she plays an Exiled Boggart, while it’s my turn to blank (though I still manage another Forest). Now turn 3, Jimi misses her first land drop though still manages a 2-point attack off the Boggart. 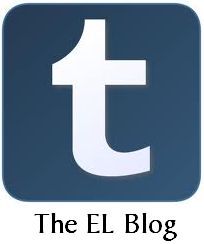 Although I hit my drop, I’m not without troubles of my own- all three have been Forests. Undeterred, I play an Imperious Perfect, letting me send in the Eulogist for 2. Jimi immediately Tarfires the Perfect, though, so the Eulogist is back to normal size by the time it connects. Next turn Jimi sends in the Exiled Boggart to put me at 16, then fetches the Tarfire back with a Boggart Birth Rite. Back to me, I attack again with the Eulogist before adding a Gilt-Leaf Seer. It’s now turn 5, and we’re both standing on shaky manabases. Jimi finds her third land (a Swamp), then trots out a Spiderwig Boggart. This gives her Exiled Boggart fear until end of turn, so she turns it sideways yet again. For my part, I activate the Gilt-Leaf Seer, noting a Wanderer’s Twig and an Elvish Harbinger– both of which help solve my mana problem. Not wanting to risk falling too far behind, I put them back then play Lammastide Weave. Though this sees off the top card of my library (the Twig), I go up a point in life and grab the Harbinger. Next turn, Jimi swings in for 4 with her Boggarts, then plays a Ghostly Changeling. Back to me, I play the Harbinger to go grab another Harbinger, knowing otherwise Jimi could just close off my access to Black mana with the Tarfire in her hand. Now turn 7, Jimi attacks in with the Spiderwig Boggart for 2, and I’m now down to 9. She then follows with a Marsh Flitter, bringing a pair of 1/1 Goblins in tow. For my part, I land a Lys Alana Huntmaster which promises to help stabilise my board. Back to Jimi, who’s solved her mana issues along with way with a Mountain and Shimmering Grotto, she attacks with her Flitter and Spiderwig Boggart for 3. Although I manage to trade my Gilt-Leaf Seer for her Boggart, she sacs one of her Goblin tokens to make the Faerie a 3/3. After putting me at 6, she follows with a Boggart Mob, championing the Exiled Boggart. 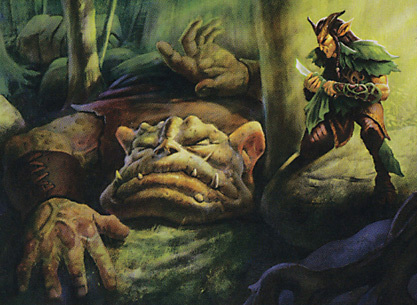 That’s annoying, but so is the Nath of the Gilt-Leaf I land on my turn, which has the added bonus of generating a 1/1 Elf token off the Huntmaster. Jimi sends in her flier for a single point of damage on turn 9, opting not to make it any larger. She then plays Fodder Launch, sacrificing her remaining 1/1 Goblin token to pay for it. This crushes poor Nath and would steal the game on the spot for Jimi were it not for my Eulogist. When the dust settles, I’m less one Eulogist and on life support at 3. All I can do is play a Lys Alana Scarblade, getting another Elf token in the process. Jimi smells victory and is relentless, playing a Tar Pitcher. She attacks for 1 with the Faerie, forcing me to snuff it out with a freshly-drawn Eyeblight’s Ending. She then attacks with the Boggart Mob, but I chump it with a 1/1 Elf. For my part, I stubbornly cling to life. The Pitcher gets taken down by my Scarblade, pitching a Scarred Vinebreeder to pay for her services. I then use the Harbinger I’ve been holding on to, tutoring up an Elvish Eulogist while netting another Elf token. I then attack for 3 with the Huntmaster, putting Jimi down to 15 life. I conclude with a Leaf Gilder and pass. Now turn 11, Jimi next plays a Boggart Shenanigans before attacking with the Ghostly Changeling and Boggart Mob. I chump the pair with Elf tokens. Over to me, I next deploy the Eulogist alongside a Moonglove Winnower, adding a pair of Elf tokens to replace my losses. I then attack for 7 with the Harbingers, the Gilder, and the Huntmaster. Jimi takes it on the chin and is down to 8. Next turn she adds a Facevaulter and second Changeling before passing. I counter with an Imperious Perfect, then discard a Hunter of Eyeblights to the Scarblade to give one of Jimi’s Changelings a staggering -12/-12. That opens up a path through for a lethal alpha strike based on sheer numbers alone. For our next match, Jimi and I trade land drops on our opening turn before beginning the summonings in earnest. Her turn-2 Adder-Staff Boggart triggers our firt clash of the match. I reveal a Prowess of the Fair, but Jimi whiffs on a land. We both return the revealed cards to the top of our library. Over to me, I open with a Wren’s Run Vanquisher, revealing the Prowess to get her at the bargain price. First blood comes the very next turn as Jimi deploys the Spiderwig Boggart, letting her Adder-Staff one slip right past my defenses for 2. I counterattack with the Vanquisher after playing the Prowess of the Fair- just in case. Now turn 4, Jimi adds Boggart Shenanigans, then summons a Facevaulter after swinging in for 4 with both beaters. Down to 14 life and not willing to continue racing, I simply add a Moonglove Winnower and pass. Next turn, Jimi swings in again with the Boggarts. I block both with my Elves, and she responds by sacrificing one to a Fodder Launch to kill my Wren’s Run Vanquisher. Between that spell’s damage and the triggers from the ding Goblins, I’m now down to 7. On the upside, I do get an Elf token from the dead Vanquisher thanks to my enchantment. Back to me, I play Nath’s Elite to trigger our second clash. I win this one as well, ripping a Jagged-Scar Archers while Jimi finds another land. After placing a +1/+1 counter on the Elite, I end my turn. Undeterred, Jimi plays a Marsh Flitter on turn 6, adding in a pair of 1/1 Goblin tokens. I play the Archers, which come into play as a 5/5. Back to Jimi, she attacks with the Facevaulter and Flitter, sacrificing a 1/1 Goblin token to each. That alone sees me go down to 5 life, and when my Winnower trades with her Facevaulter I lose another from the Shenanigans. Left at 1 after the Faerie exacts her toll, Jimi finishes me off with Tarfire. We’re now even at a game apiece, but this time it’s my turn to lead things off. I begin with a Swamp; Jimi follows suit but adds a Facevaulter behind it. Next turn, I again drop an early Wren’s Run Vanquisher, this time revealing a Moonglove Winnower. Jimi plays a Mountain and passes. Now turn 3, I swing in with the Vanquisher for opening blood. I then add a Gilt-Leaf Seer and pass. Over to Jimi, she brings out a Mudbutton Torchrunner. Back to me, I swing in for 5 off of both Elves, then pass. Jimi plays a Marsh Flitter, but looks at my four open mana (and perhaps remembering the four-drop I revealed to play the Vanquisher), and rightfully smells a rat. As she goes to pass her turn, I play the Gilt-Leaf Ambush anyway. We both reveal lands in the clash, and both flush them to the bottom. Now turn 5, I double my Elf population with an Elvish Promenade, putting another four 1/1’s into play. I then attack in with the Vanquisher for 3, leaving Jimi at 9. Back to her, she plays another Mudbutton Torchrunner, then attacks in with the Flitter and Facevaulter. She then feeds a Torchrunner to her Faerie, directing its 3 damage to kill my Vanquisher. I block the Facevaulter with a trio of Elf tokens, leading her to eat the second Torchrunner to ensure an all-around trade. This time the 3 damage hits me in the face, and she then cleans up with a Tarfire to kill off the Gilt-Leaf Seer. I trigger her on the way out to get a gander at the top two cards of my library. Next turn, I swing with a trio of 1/1 Elves to put Jimi down to 6 life. I then tap out to play the last two cards in my hand, a Moonglove Winnower and Leaf Gilder. Jimi attacks me for 1 with the Faerie, then plays a Hornet Harasser. My turn 7 is a blank, while Jimi attacks in again with the Faerie for 1. She then plays Boggart Mob, championing a 1/1 Goblin token. Back to me, I add an Elvish Eulogist, which Jimi matches with a Lowland Oaf. Jimi’s down to one card herself, and our turn 9 is a blank for both (though she plays a freshly-drawn Shimmering Grotto). Now turn 10, I draw the breakthrough card in a Nath’s Elite. With the clash, I flip a Prowess of the Fair while Jimi reveals a land (deja vu all over again). That gets the Elite a +1/+1 counter, and I pass. Back to Jimi, she plays a Ghostly Changeling. Next she attacks for 1 with the Flitter in the air, sacrificing the Hornet Harasser to it to make it a 3/3. The Harasser gives another creature -2/-2 until end of turn when it leaves play, and combined with a Tarfire it’s enough to pull off a kill of the Elite while dropping me to 12 life. Just like that, Jimi has slipped the noose. Next turn I play the Prowess of the Fair. Jimi adds a Facevaulter, then attacks in with the Changeling and Faerie. I block the Changeling with a pair of 1/1 tokens and my Gilder to make sure it dies, though Jimi takes all three with it by pumping up the Changeling (though I get a “rebate” of an Elf token from the dying Gilder). She then eats a 1/1 Goblin token to make the Flitter a 3/3, putting me down to 9. My turn 12 is a complete blank. Jimi plays Warren Pilferers, letting her get a Mudbutton Torchrunner back from the yard. She then attacks in with the Pilferers and Flitter for 4. I take it, and drop to 5. Jimi’s rewarded with a 1/1 Goblin Rogue token from the Mob, since she’s finally connected with a Goblin. Next turn, I play a Forest and pass. Jimi recasts her Torchrunner, then sacrifices it to the Marsh Flitter as she moves in for the kill. The 3 damage is sent to my face, dropping me to 2. She then taps the Oaf to give her Facevaulter +1/+0 and flying. Next, she feed the expended Oaf to the Facevaulter to make it a 4/3, adding the Pilferers to make it even larger. At this point, I’ve had enough and lash out with an Eyeblight’s Ending to kill it. I then sacrifice the Eulogist to gain 7 life, putting me at 9. The Marsh Flitter still gets in for 3, however, and I go back down to 6. On the upside, the loss of the Eulogist gives me another 1/1 Elf token, and at the end of the turn I add a couple more from a Gilt-Leaf Ambush (the clash shows us both land, which goes right to the bottom). It was a risky play and Jimi knew it, but it was a chance to close out the game. I swarm in with Elves on the counterattack, and refresh losses with another Winnower and Eulogist. Jimi’s spent, and after drawing next turn she concedes the game and the match. I take notes for the matches with a college-ruled standard notebook. Names, turn numbers, and land played are on the left, life totals on the right, and the contents of a turn fill out the rest of the middle space. For the most part, it’s enough space to keep track of a game of Magic. As it happens, I’d have been much better off with a landscape-oriented legal pad for Lorwyn. One of the “failures” discussed in the opening review of Elvish Predation was the complexity of the board state, and it’s hard to say that Aaron Forsythe was wrong in this estimation. I’m all for intricacy, but his criticism was spot on. I had a ton of arrows and asterisks, finishing out the contents of the turns at the top of the page, the bottom (always risky in case you need it later when the game goes long), or, in at least two exchanges, a new page altogether. It might not seem that way from the narrative, but there were a number of pregnant pauses throughout the game as we assessed and reassessed the board state for things like token generation and how many Elves were in my graveyard. 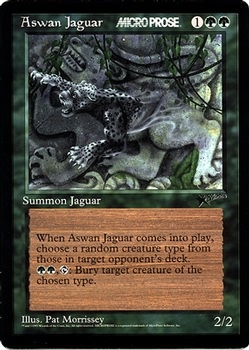 Back in 1997, MicroProse released a computer game based on Magic: the Gathering which contained within its card pool a dozen new “Astral” cards (most famously, the Aswan Jaguar). Astral cards were almost by necessity computer-only, since they dealt with calculations that needed technological assistance. Many of these were random effects, such as Orcish Catapult (Randomly distribute X -0/-1 counters among a random number of random target creatures.) I suppose with enough time, paper, and dice you could manage to play Astral cards, but it’s hard to imagine that the time invested would be worth the scant payoff. 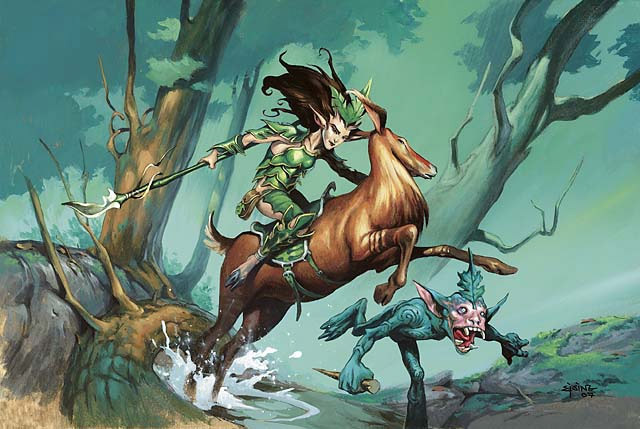 If your first experience with many of the cards in Elvish Predation was with Duels of the Planeswalkers, watching 1/1 Elf tokens pop up left and right might have seemed a natural thing. But for a paper game of Magic, it felt like a bit too much bookkeeping. That isn’t to say that the deck is unfun. It’s a solid tribal construction that starts to find its stride in the midgame as you’re able to get more and more out of your Elvish cards. It does lack something with removal, which is a bit disappointing given the inclusion of Black. Thanks to the expense of a number of its core components, however, the deck is susceptible to faltering if it doesn’t hit its mana targets. 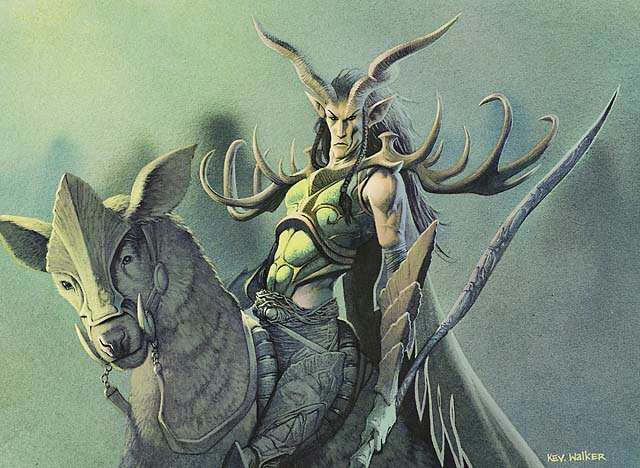 In the game I lost- game two- I died with an Elvish Promenade and Imperious Perfect in hand, eager to flood the board with Elves then pump them up for a surprise assault. The Goblins by no means seemed like fast aggro, but unable to get everything in play in time I wasn’t able to pull it off. There’s a bit too much business in the three- and four-drop range, and it feels like the deck can trip over itself a bit sometimes. Overall it was a good introduction to Lorwyn, though nothing terrifically exciting. The deck is a difficult one to find at a reasonable cost these days in large part to the value of certain cards within it, but taken as an organic whole it seemed a bit underwhelming. Is that why I like my elf deck? I get some casual fun use out of the accounting degree. Seriously though, it does get complicated the more lords and such that hit the field. It’s not a deck I’d want to give someone new to the game. Really too much, as you said, bookkeeping. It’s a lot to keep track of. Clash I just find boring. Nice matches though. I’m sure you went through a few pages in that notebook/pad. the bookkeeping in here is nothing compared to Merrow riverways. I find this quite relaxing in comparison. in MR you have the bookkeeping but you can’t win with it.